Last month we had the honour of working with celebrated London florist Amie Bone on a collaboration for her Enamour, National Wedding Show showcase. 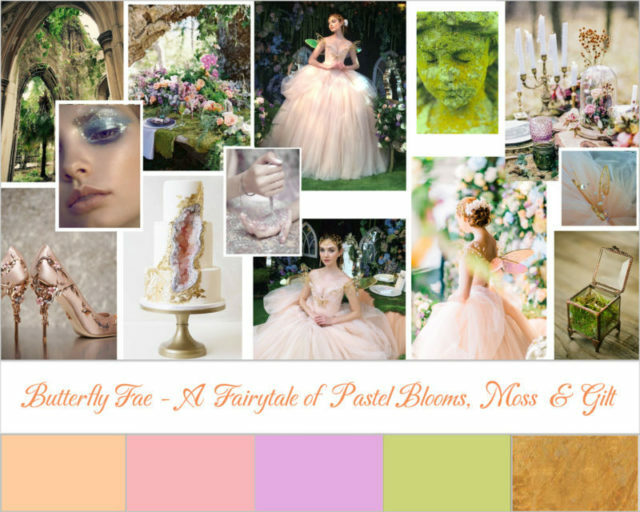 The peach tulle couture dress we created for the show has been named Butterfly Fae (Butterfly Fairy). It features our specially designed jewellery pieces on the corset with a gold & crystal butterfly at centre front & wirework wings forming the shoulder decoration. The jewellery work alone took several weeks to complete; this is the first time we have really combined our gown & accessory work into one project. It would be fair to say that the shoulder treatments would probably not be suitable for the required levels of ’embracing’ brides are expected to do at weddings, so the straps were designed to be removable. You can see more images of the dress in this previous blogpost about our collaboration & see Amie’s inspiring ideas for a magical, secret garden, fairytale wedding. This post continues our series of inspiring moodboards designed to give brides ideas of how they can incorporate our gown designs into stunning wedding day themes that will leave their guests swooning. Unsurprisingly & given our gown was designed to fit Amie Bone’s vision, our moodboard has a similarly magical garden theme accented with the hot new wedding trend for Geode/Quartz/Marble cakes & oh so desirable Ralph & Russo dreamy heels. More on our Pinterest Board.